While the U.S. economy merits a degree of optimism, as the recovering housing sector has supported improvement in the labor market and consumer spending, we question the outlook for the balance of 2013. A key indicator in our research reveals that expectations are getting ahead of themselves. 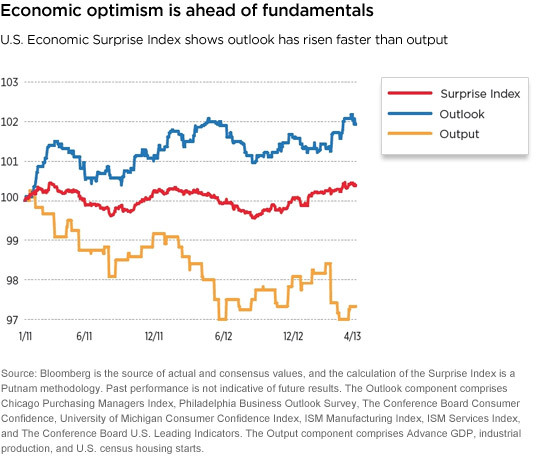 The Economic Surprise Index measures the difference between forecasts of several types of economic data and the eventual reports of that data. We do not expect smooth sailing on the horizon. Although first-quarter GDP may have expanded at a faster rate than the previous quarter’s 0.4% pace, the economy may hit an air pocket in the second quarter. The full effect of the federal fiscal consolidation now underway — the higher payroll taxes that went into effect at the beginning of the year, and the spending cuts that began in March — will not be clear in economic reports until well into the second quarter. We forecast that federal fiscal consolidation will likely reduce 2013 GDP by about half of one percent. That would not cause a recession, but could undermine growth in corporate earnings. Also, as the calendar moves into the spring months, the seasonal adjustment factors applied to the data become more challenging. Uneven economic data could easily prompt greater market volatility than we saw in the first quarter. Read more in the second-quarter Putnam Capital Markets Outlook.